At Warwoman Dell the trilliums are not ready to bloom as yet. 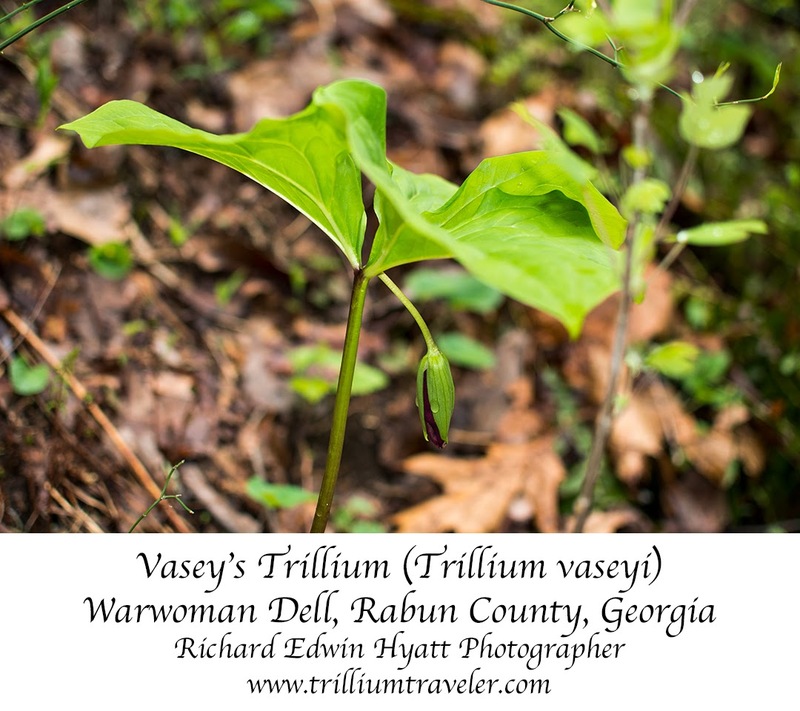 That is except for one Vasey's Trillium I did not photograph. It was well into the natural garden of trilliums and other wild plants and I was afraid my footsteps would degrade the garden. This is a Vasey's that was nearer the trail. As you can see the bloom is below the whorl of leaves and is a red or maroon color. The Vasey's is nearly as tall as the Large-flowered Trillium. The Large-flowered Trillium is our tallest trillium and has a white flower with a yellow center that blooms above the whorl of leaves. When in the forest take nothing but, pictures and leave nothing but, nothing! Please stay on established trails and leave the forest as you found it. Well, you can take the trash out that less caring people leave.